039.Lily & Honglei – JavaMuseum 2010 – Celebrate! 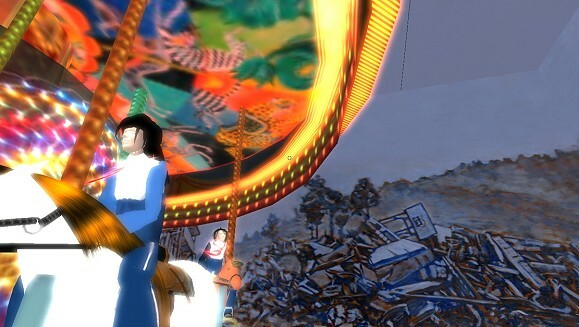 Lily Xiying Yang and Honglei Li are new media artists from Beijing, currently based in New York City. Since 2005, they have been working under a collective name Lily & Honglei. Their creativity aims at developing new artistic expressions through integrating traditional art forms such as painting and Chinese folk art with digital language. By utilizing online virtual world and digital animations, Lily & Honglei’s work are devoted to the reinterpretation of Chinese folklore traditions that remain highly relevant in reflecting on the current globalized culture and society. 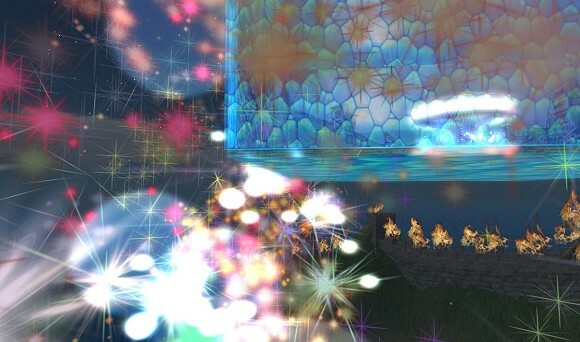 Celebration is a virtual installation constructed within Second Life, the popular online virtual world. This multi-user-virtual-environment (MUVE) is designed to provoke inquiries to relation of development, social crisis and cultural traditions. The Great Fire Wall, the notorious Internet censorship that isolates the largest netizen population from rest of the world. We use the spatial relations of the 3D-rendered elements to imply the interconnections between socio-cultural phenomena and problems.